Free Christmas Card Template to download here. The holiday season is just around the corner, and we have a gift for you! Get our Canvas Christmas Card Template for free! This template normally sells for $12, but you can download it for free here. 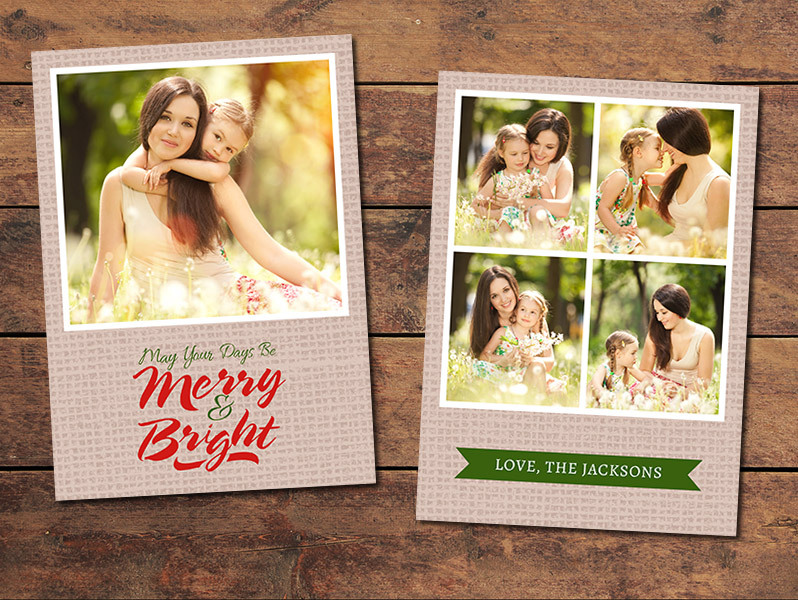 Use the card for yourself, or create a Christmas card for your clients using your photos. The template is for a 5 x 7 card (with bleed) and includes both a front and a back design. Easily change the colors, if desired, and insert your photos with the help of clipping masks. A documentation PDF is included in the download to provide instructions for inserting the photos. If you are familiar with clipping masks it is very straightforward. This template was designed to meet the printing specs of Bay Photo Lab. It could be printed elsewhere, but may need minor tweaks or adjustments. Regardless of where you have it printed, be sure to read and follow the instructions to prepare your design and submit it for printing. If you’re looking for more templates, our PlanetPass currently includes more than 100 print templates (plus Lightroom presets, Photoshop actions, photo overlays, and more) and more on the way.